I love being able to look back on memories of first encounters and document how my perceptions changed with time. Over the Christmas holidays several years ago, when I was still a New Yorker making the bi-annual pilgrimage to visit my family in Costa Rica, I happened upon the statue of La Chola de la Avenida. In my understanding, the term “chola/o” in Latin America and parts of the Caribbean means “one who is black/of Afro-descent but mixed with Indian/indigenous blood and having straighter hair.” And so it was with outright surprise that I walked right into a larger than life-sized bronze stature of a voluptuous chola woman in downtown San José. I stood stock still, in shock, vaguely aware of the holiday bustle around me. I circled past her and then came back, intrigued and unsure. How was this woman, named La Chola, right in the middle of San José’s main pedestrian thoroughfare? Getting my camera ready to document her presence, I began to notice that everyone walking past her – children, mothers, fathers, high-school kids, abuelitas – all reached out and slapped her backside, some even rubbing with an extra tenderness, yet all doing so with collective glee. My five-minute observation made it clear that they were used to this interaction with the statue and her rear end, in ways that felt similar to scratching the head of a favorite dog. I cringed and marveled at the fact that among the hundreds of people out on the Avenue that December afternoon, I may have been the only one “reading” this statue in the way that I was. When I returned to my cousins in the car, I asked about the statue and noticed no one was hyper-ventilating in the way I was about the backside-slapping ritual. Everyone laughed at my seriousness, and someone eventually grumbled that rubbing La Chola’s rear was believed to bring good luck. 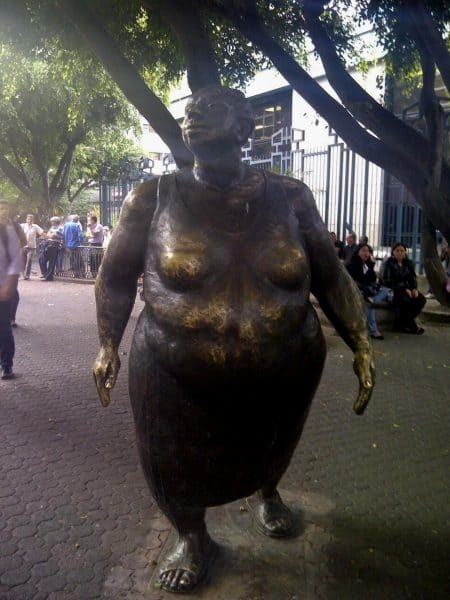 I was told that she was part of Costa Rica’s wonderful public art programs, yet an artist’s name was never mentioned. Let me tell you all that raced through my mind as I watched Tico after Tico raucously slap La Chola’s bronze behind, many going directly afterward to buy the “lotería” from the lady selling the possibility of luck nearby. All my womanist and race-conscious antennae were on overdrive! I pondered the artistic decision to reference a “chola” or dark-skinned person, full of her glorious curves. This virtual Buddha seemed to be made into both a joke and the haphazard bringer of extra colones. I thought about Sarah Baartman, the 19th-century South African slave who was taken in 1810 to London and Paris and put on display for public view because of her “voluptuous” rear end. I spent years researching and writing about Sarah and the ways in which Black women around the world continue to be displayed today – think about Beyoncé and Nikki Minaj in the U.S. media, for example. One of the questions in my work as a scholar of slavery and its legacy is, “Who protects the Black woman’s body?” When I met La Chola, I claimed her as someone of African descent and so my lens was singular in how I perceived her. My instinct was to protect her. Today, as I selectively interject in the current social media fervor about Beyoncé and her political (and capitalistic) positioning, I remember that moment of facing La Chola for the first time on Avenida Central. This past January, it was rumored that Beyoncé would enter the acting world by scripting the biopic of Sarah Baartman, whom she would play. Within 24 hours, rumors were shut down, and Beyoncé was kindly asked to keep her day job in the music industry. The fierce protectiveness of Sarah Baartman came from all corners of the globe. I, too, participated in the need to keep sacred one whose legacy has been so misrepresented. In these cyber conversations, I remembered feeling the exact same way as I witnessed Ticos slapping La Chola’s rear end. So, rather than hold onto my feelings of apprehension, I began researching the sculptor, Manuel Vargas, who made her. Vargas is from Guanacaste in the northwestern corner of the country. His work is Elizabeth Catlett-like in stature and beauty. One of his singular themes is the honoring of the women, the mothers, who were a part of his life growing up in Guanacaste. These works, across the country in public spaces and in private collections, are the testimony to the largesse and power of Costa Rica women. Multi-hued Costa Rican women. Knowing this made me see the statue differently. Given my personal experience, linking Sarah Baartman, Beyoncé and La Chola together in the same legacy of exploitation made sense to me. But I was wrong. When I see La Chola now, I want to kiss her and hold her lovely face which stares upward into the bright blue Costa Rican sky, her bronze legs firm like tree trunks. I am so happy to be wrong, joyful that my own fears about vulnerability and black womanhood and public spaces have been turned on their heads. This is why I love living in Costa Rica, because every day I have to push past my own ideas and ways of thinking. My feelings about the behind-slapping ritual remain problematic when I interpret that as an action deeply rooted in Costa Rican gender dynamics, but that discussion is for another time. In “re-seeing” La Chola within her Costa Rican context, I not only changed my point of view, but also experienced an “aha moment” when I confirmed that there was indeed a history of Afro-Costa Rican lives beyond the Caribbean coast: women who lived and worked in Guanacaste, chola women, full and round in their beauty, which Vargas captures so poetically. Vargas’ work, for me, begins a dynamic conversation which other Costa Rican artists, such as Guadalupe Álvarez Rojas, have continued: facing Costa Rican history with a complex artistic lens which insists on the realistic and historically honest inclusion of all the human ingredients that, in fact, make up the Costa Rican nation. Natasha Gordon-Chipembere, a writer, professor and founder of the Tengo Sed Writers Retreats, moved to Heredia, Costa Rica with her family from New York in June 2014. She may be reached at indisunflower@gmail.com. “Musings from an Afro-Costa Rican” is published monthly.